This Marathi dish takes a lot time to prepare and needs a lot of patience and practice to reach the perfection. 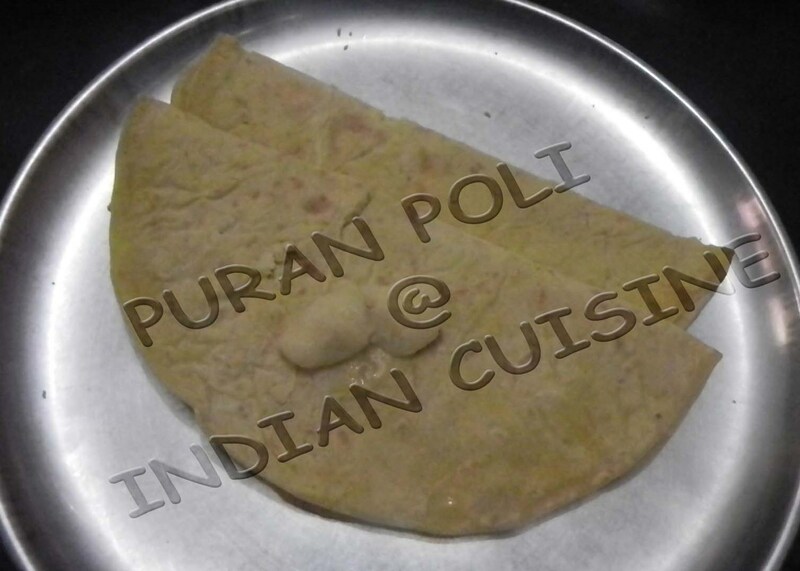 Puran Poli is a very famous Maharashtrian recipe. In kannada this recipe is called as Simply Holige or Bele Obbattu and Bobattu in Telgu. This is also very famous in Konkani people. 2 cups Chana dal, soaked in water for around 2 hours. 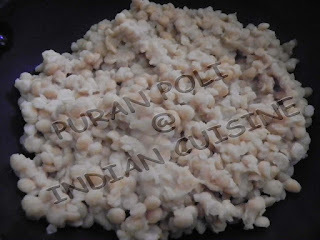 Cook Chana dal in pressure cooker till it turns soft. Drain out excess water until the dal is absolutely becomes dry. In a non stick pan, put Chana dal, Jaggery and mix it well. 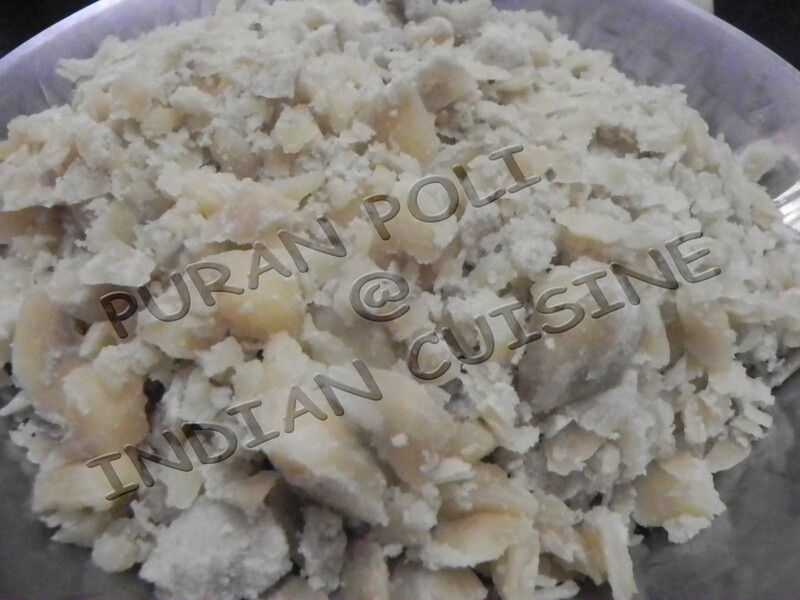 Cook till all the jaggery gets melted and the mix becomes dry. Grind the mix in a mixer to get a smooth paste without putting water. Add cardamom powder and mix well with hand to get a smooth mixture. Form balls of 20 equal size as shown in the picture and keep it aside. 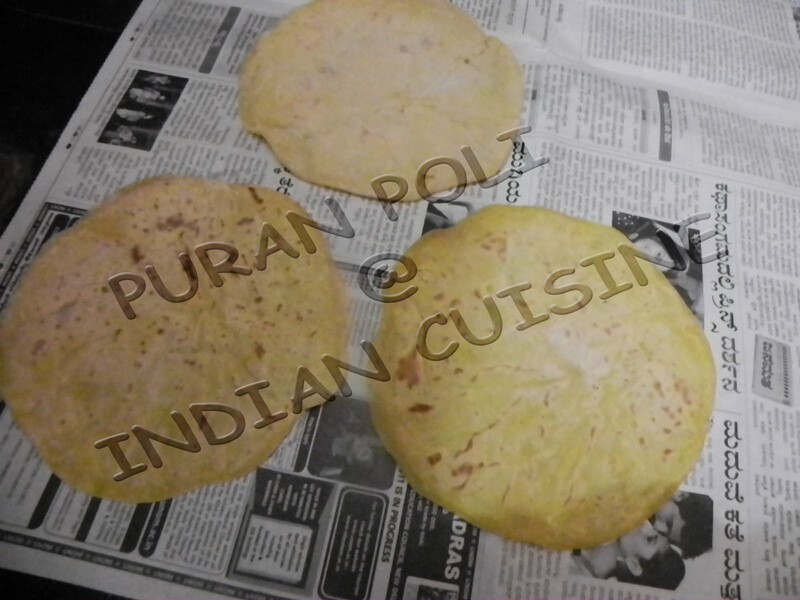 Mix refined flour, oil, water and turmeric powder. Make very soft, sticky dough. Divide into 20 equal portions. Cover and keep it aside for 2 hours. With greased palms, take one portion of dough(Kanik) and flatten it with another hand to form a disc of the size of the palm. 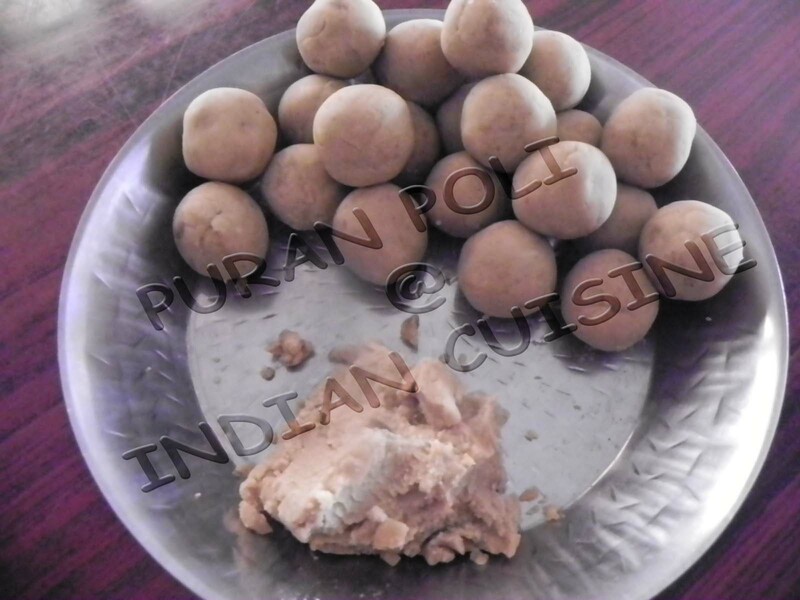 Place a ball of "chana jaggery" paste(Hoorna) in the centre and fold the disc from all sides to cover the paste completely. Put 1 cup of Maida/Plain flour on a paper and put all the prepared balls on the flour one by one. 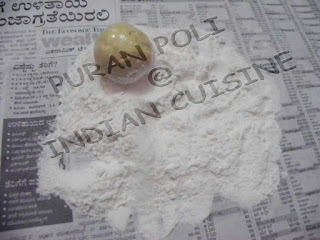 Roll the balls over flour so that flour gets stuck to the ball from all the sides. 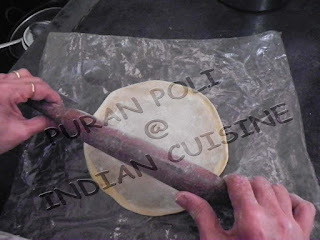 Apply oil to a sheet of clean transparent plastic paper, keep the ready ball on it and roll it like chapathi. Fry on hot tava till it gets golden brown color. 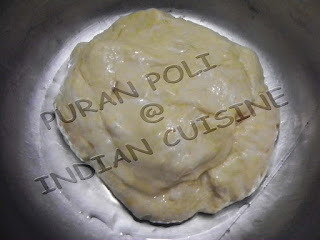 PS: Use of milk instead of water for making the maida dough makes puran polis very soft. 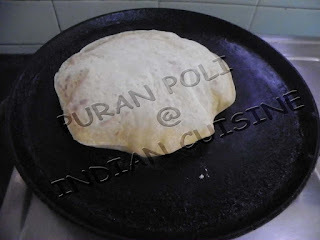 Along with chana dal, toor dal also can be used which makes the puran poli more thin and soft.